I’ve done a few posts and videos about mining since I started this blog, and get lots of questions! Here is an introduction and some answers to FAQ’s – they don’t delve into all the details, and provide a good overview for a new or aspiring miner. Why mine for Crypto currencies? If you have the ability to understand the basics of cryptocurrency, have a little bit of technical skill, and have access to electric power that is relatively inexpensive (< $0.10/kwhr) then mining is a good way to obtain crypto-currency at a discount, buying a little bit every day. My experience since late 2015 is that a current model mining rig that you buy pays for itself in about 10 months of mining. You will be able to continue using that mining rig profitably until there is a version using smaller semiconductor technology available. 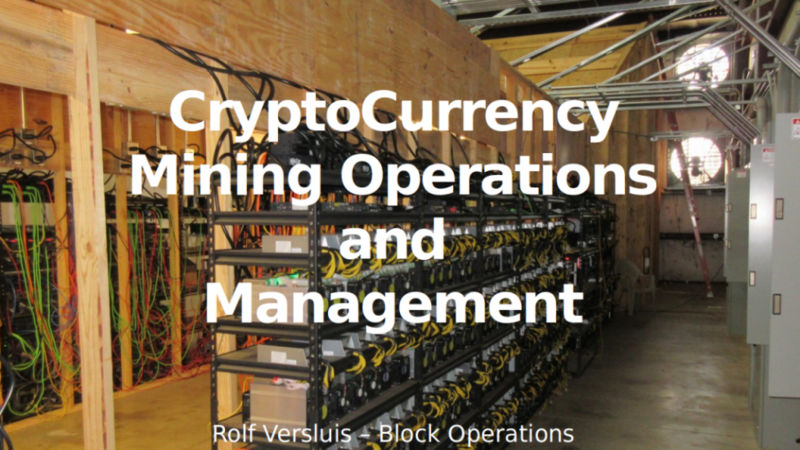 For a more complete answer, this is my story on why and how I started cryptocurrency mining. What can I mine with different mining rigs? It depends on the hashing algorithm the cryptocurrency uses. The general progression for any new hashing method is that it can be solved by a CPU (processor like Intel) first, then GPU (graphics card), then ASIC (Application Specific Integrated Circuit). CPU’s can do just about anything, GPU’s are more limited, and ASIC’s are usually for one type of hashing algorithm only. Each algorithm usually has a major cryptocurrency that started it, then many other cryptocurrencies that use that algorithm. It is usually best to start with mining the major coins. Later, as you get more experience, you can mine minor coins and trade them for major ones. Here is a blog post about how I look at different altcoins and evaluate them. Why Bitcoin Miners Should also Mine Dash, Litecoin, and Zcash. There is also a link to a video on what I was mining back in early 2017. It is easiest to buy a single ASIC mining rig and a power supply, and start mining. Don’t research too much, realize you are not going to make the perfect decision, and just get started. If that works, then buy more and continue. If not, stop. If you are going to buy more than a few miners, it is best to buy directly from the manufacturers. If you just want to start with one machine, buy from from Amazon. You will pay more than if you buy it directly from the factory, but you can pay with a credit card, and if you buy from a Prime seller, can return for a full refund within 30 days. ASIC miners do not come with a power supply – you need to buy one of those also. Here are some links to different ASIC miners and power supplies on Amazon. Make sure you don’t just buy from the Buy Box vendor, look for the offers from other sellers. And only buy if it is in stock – don’t buy a pre-order! The power supplies run better on 208 volts or higher, like the outlets for electric dryers. You may need an electrician to connect one up for you. The Antminer S9 is loud! So is the D3! The L3++ might be ok to run in a next door room. Is it Better to Start with GPU Mining? There are some good reasons to begin with a GPU miner. You can start with less money, and it is more flexible. If you already have a computer with a graphics card, you can start GPU mining for altcoins right now. Another way to get started is to build a GPU mining rig. You can start with one GPU, and add more as you get the funds. Here is a complete guide to buying and building your own GPU miner. What are your mining facilities like? I started in my basement, then rented a small warehouse, and after that a larger warehouse. Right now I have about 450 miners. Here is a post with pictures and a video of my two mining facilities, as well as the different miners in action. Answer comments on blog posts and videos when I have a chance. How can I calculate the profitability of different miners? Look up the specifications of the miners, then plug them into the fields on cryptocurrency mining calculators like Whattomine and Coinwarz. These websites already have good values for each of the cryptocurrency’s hash power and price, perform the calculations, and rank them in order of what is the most profitable to mine right now. Where should I hold my cryptocurrency? I like using cryptocurrency exchanges, but I try to keep as little of my funds on them as possible. For any cryptocurrencies I intend to keep more than a few weeks I keep them on a wallet. For any cryptocurrency I mine to a wallet application on my computer. A worthwhile coin will have a wallet that works on Linux or Windows. Mine to that wallet, and back up the wallet file and private keys so you don’t lose your funds. Longer term, I keep my cryptocurrency on a hardware wallet as much as I can – I have an article about hardware walllets here. Latest and best ones to buy are Ledger Blue and Trezor Model T. I prefer to buy directly on manufacturer’s websites. Don’t use a paper wallet. They are easy to lose, and hard to use properly. If you don’t control your cryptocurrency keys, you don’t control your funds. Learn to keep them off exchanges except for whatever amount you are actively trading. How Can I build and operate a Bigger Mining Operation? Small – Someone who has 1 – 50 miners and operates them at his or her house of office. This is a hobby operation. Medium – 50 – 500 miners. Operating them is a full time job or a significant part time operation. This is usually a family operation or a private business. Large – >500 miners. These are full businesses, with employees, investors, processes, procedures, and optimize for profitability. Large miners operate like a small business. Mining can be very profitable, but there were many years when mining was not, and only the miners with the lowest operational costs could stay in business. This blog is oriented toward the medium size miner who can deploy more machines than the small miner, and has more operational flexibility than the large miners. How Can I Buy Miners at a Good Price in Large Quantity? Buy them directly from the manufacturer. In late 2017, that means having crypto-currency in a wallet and ready to spend. I buy most of my miners from Bitmain. There are other good mining manufacturer’s out there, but the Bitmain Antminers have the best price and performance. You can usually buy up to 50 or 200 miners per order from Bitmain. Sometimes you can even pay them with a wire transfer in fiat currency. The problem is, if you go to the Bitmain website, most of the miners are sold out. It is possible to buy them, though. Follow Bitmain on Twitter and Facebook, because they announce 12-24 hours ahead of time when they place miners on sale. When they go on sale, work as hard as you can to get the miners in your cart and check out within a two hour window. After that, they are usually sold out again. There are occasionally other companies that pop up claiming too have the best miners available. Unless you know someone who has one of their miners, don’t order from them, as they are probably scam websites. How can I cash out my mining profits? My recommendation is to keep as much of what you mine as long as you can. You can minimize taxes in the USA by holding the cryptocurrencies you mine for more than a year, because then any increase in value is taxed as a long term capital gain. At some point, you need to pay some bills. Or pay off your house. So what do you do? In order to process any significant volume, you will need to provide identification to satisfy their KYC/AML (Know Your Customer/Anti-Money Laundering) rules. Exchanges that process fiat currency operate much like banks. After signing up and providing identification, connect your exchange account to a bank account. Make some small test transfers of a fiat currency like US Dollars both ways. When you want to sell (or buy) cryptocurrency, use the trading part of the exchange. For Kraken, that is part of their main page. For Coinbase, that is on GDAX, which shares a login with Coinbase. Set up limit sells or buys. Then transfer the funds to your bank account. Take note of the daily, weekly, and monthly transaction limits when planning your sells and transfers. There are also decentralized cryptocurrency only exchanges, but those are harder to use. After trading the altcoins to BTC, ETH, or LTC, withdraw them to a deposit address at Coinbase, Kraken, or Bitstamp, then sell them using limit orders on the exchange. What would you mine right now? Will mining ever become unprofitable? What do you do about taxes? Do you worry about security? Where should I buy miners from? Can I use an exchange address for my mining address? Can I hire you to help me with a problem or consult on building my mining facility? Not now or in the foreseeable future. I am not interested in consulting work. Can invest my money with you so you can build a bigger mining facility and provide me cryptocurrency? No, not interested in investments. I am all set.